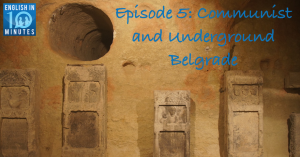 Nick and Wendy talk about two walking tours they went on during their recent trip to Belgrade. One was a communist walking tour mostly about Tito, while the other took them underground to some of Belgrade’s hidden places. The episode comes with a worksheet containing a transcript of the conversation, analysis of the best vocabulary, and discussion questions to help you go even further.